Join Kumar and Koom as they discuss Alan Moore’s run on the palladium paragon, the alabaster avenger, the archetypical archetype: Rob Liefeld’s Supreme. Kumar tries not to lose it over the Image era ‘artwork’ while Koom attempts to reconcile supremium with revisionist theory. Supreme was Moore’s last outing with a true blue superhero in the classical mould. Both postmodern and nostalgic for lost comic values at the same time, this run sits Janus-like between Moore’s early work and his modern period. 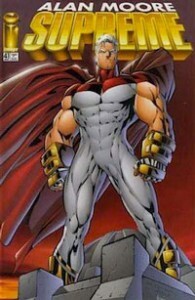 This entry was posted in Deconstructing Comics and tagged alan moore, image comics, rob liefeld, Supreme by TimDC. Bookmark the permalink.